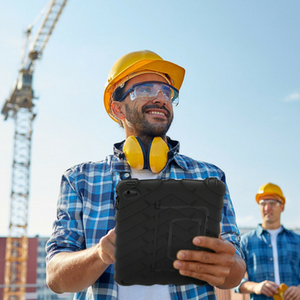 The latest rugged tablet PCs are set to make it easier to take tech into grimy, damp or accident-prone work environments – without breaking the budget. Anyone who has a work place that has high levels of vibration, dirt or moisture knows that keeping a device working and reliable on the job means that it has to be specifically designed to be rugged or it just won’t last the whole working day. Mining or construction work, food delivery or outdoors workers are discovering the benefits of tablets on the job, as they integrate tech into the standard day’s tool set and improve efficiency and productivity plus reduce the time needed to transfer information from one system to another. Leading brands Samsung and Panasonic have heard the call, and have new rugged tablets ready for business, plus leading accessory brands such as RAM Mounts are helping businesses to mount and protect most devices so that users can maximise their productivity by using mobile technology on the job. Panasonic Toughpad FZ-A2 10.1″ delivers true ruggedness that is ideal for highly mobile outdoor workers in challenging conditions. Easy to use with a capacitive, sunlight viewable 10- finger multi-touch IPS display, this Android 6.0 device can be used in the field whilst benefiting from connectivity options to ensure data is always available when needed. The ruggedness is built in, with an IP-X5 water resistance level, IP-6X dust resistance plus MIL-STD-810G certified. Gravity drop resistance of 120cm it can handle the inevitable drops of a busy working day. Toughened by a magnesium alloy chassis encased with ABS and elastomer corner guards, the Panasonic Toughpad FZ-A2 also features flexible configurable ports and business expansion capability, while adding just 880g to the work bag. If you aren’t needing something quite as tough as a Toughpad, you can also try the Samsung Tab Active 2, which is a macho 8.0” big brother to the other Samsung Tabs. The Galaxy Tab Active2 and S Pen are water and dust resistant, with an IP68 rating, to shield against many of the harsh outdoor challenges that field engineers face and the rigorous pace of indoor office environments, including condensation, accidental spills, and damaging dust. The Galaxy Tab Active2 features a firm, non-slip grip even in extreme construction environments while its ruggedised, anti-shock cover is designed to withstand most drops of up to 1.2 metres. For mobile workers, keeping the device powered up while using the battery-draining GPS all day is important. A vehicle mount can power and keep your device just where you want it. There are a few options from RAM Mounts for the Tab Active2. Slip your Tab Active into RAM Mounts IntelliSkin case with GDS technology and the ruggedised power adaptor will protect the charging port while docking the device 100 times a day, on the compatible GDS Vehicle Dock. It is a dual spring loaded, quick release cradle that offers a secure fit with easy access to the tablet. Without the need to remove the IntelliSkin from the device, the user can quickly and efficiently mount the device in the vehicle dock and keep the device charged. The Intelliskin case also has options to add a hand grip or shoulder strap to make it even easier to use for work. RAM® Mounts also has a powered vehicle cradle for the Samsung Galaxy Tab Active 2. The cradle has been designed to meet the demands of field workers in a variety of applications including transportation, field sales, logistics, manufacturing and much more. This low-cost cradle provides power to the device through the pogo pin interface on the tablet and can be easily rotated for both portrait and landscape operation of the device. For security and theft deterrence, it features a keyed lock. Unique features include access to the NFC reader while in the cradle for scanning NFC tags as well as the stylus.